The American Airlines Boeing 787 Dreamliner. Before this review flight, I had never once set foot aboard American Airlines. I’ve lived in Chicago for five years, but my lifelong loyalty to United has far overcome any desire to try ORD’s other legacy carrier, until now. I crossed over to the dAArk side in May, cheating on my beloved United after the announcement of yet another catering cut from the bean cashew counters. Did I actually switch to American Airlines over a meal? No, but United’s snack – a paltry “wrap” with 14 lonely grapes – was truly a new low in the ongoing ‘snackification’ of shorter flights. United semi-reversed(ish) its meal cuts and reintroduced a few exception routes – flights that receive meals despite the short flight time. Passengers on from Chicago O’Hare (ORD) to Denver (DEN), Houston Bush Intercontinental (IAH), New York LaGuardia (LGA), and Newark Liberty (EWR) get meals, even under United’s awful new meal policy. Unfortunately, Chicago (ORD) to Dallas/Fort Worth (DFW) – previously a route that received meals – did not make the cut. It was time to check out the competition! United’s $343 one-way economy fare from Chicago O’Hare (ORD) to Dallas/Fort Worth (DFW) was high enough to look elsewhere. I searched for greener pastures in a very unfamiliar territory – aa.com. With tremendous ease, I booked a one-way fare on American – in first and on the Dreamliner – for $265, less than United’s regular economy fare. Not exactly a difficult decision! 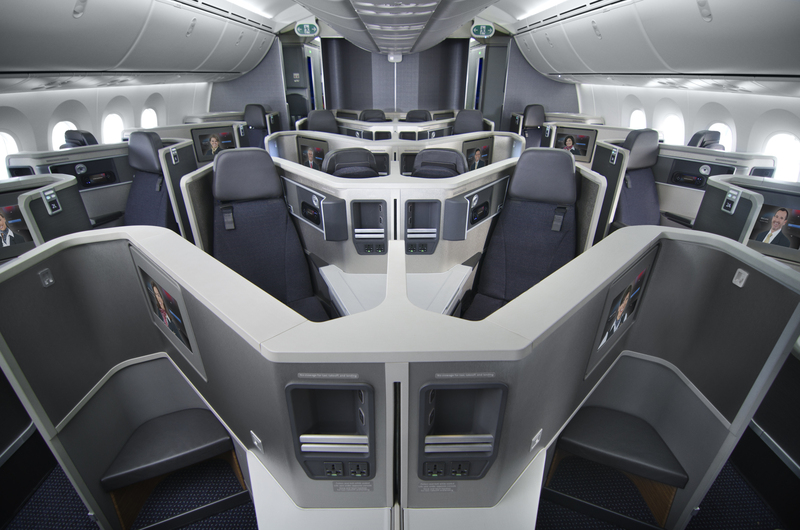 American’s Boeing 787-8 Dreamliners have fewer seats – just 28 – compared to United’s 36 on the same aircraft. Granted, American’s seats are arguably better since they have all-aisle access, but that small(ish) cabin means fewer upgrades. As if it wasn’t hard enough to score a business class seat, American announced it’s removing eight business class seats from its Boeing 787-8s, reducing the cabin to just 20 seats. The current business class mini-cabin behind doors 2L/2R is being replaced by 28 Premium Economy seats – four rows in a 2 x 3 x 2 configuration. That’s good news overall since American is adding Premium Economy, but terrible for those of use trying to upgrade or find award tickets. The larger – and soon to be only – business class cabin has 20 seats in a rather unique zig-zag configuration. The even-numbered row solo seats (2A/L, 4A/L, and 6A/L) face backward, as do the odd-numbered middle seats (1D/H, 3D/H, 5D/H, and 7D/H). Personally, I highly recommend flying ‘backward’ (in a rear-facing seat) if for no other reason than to mix things up a bit. It’s actually not terribly noticeable, but it is fun to stare at the engines and incredible shape of the Dreamliner’s wings. Even for non-AvGeeks, it’s mesmerizing (okay, maybe just “cool”) to watch the wings flex. The seats are narrow and especially tight compared to the fantastic seats American installed on its Boeing 787-9s (check out Gary’s review). Storage is limited and privacy is somewhat lacking. While it was delightful to have a flatbed seat on a two-hour hop down to Dallas, I would not be as pleased on some of American’s longer 787-8 flights, like Chicago – Shanghai. American lets you pre-select your entree. I had the option between oatmeal or an omelet, I chose the latter. Flight attendants used carts for the service; I’m assuming that was because the flight was a widebody (two aisles) and relatively short at ~90 minutes. I appreciated the efficiency, although American could really use some galley cart covers like Delta. Biscuits were passed around in a basket after trays were delivered. The omelet tasted like most airplane omelets – bland and institutional. The fruit was fresh, crisp, and every so slightly more premium than United by including kiwi and berries. Flight attendants were proactive with drink refills and seemed genuinely pleased to be onboard that morning. The smiles seemed natural and the crew were in good spirits. I asked for some Biscoff cookies from economy and received a bag full of the sinfully delicious biscuits. Seriously, American, what’s the deal? United has an incredible app, providing oodles of detailed information down to the propulsion of the two General Electric CFM56-7B26 high-bypass-ratio turbofan engines (26,300 pounds, since I’m sure you were wondering). Nerd moment aside, I never realized how much I valued the sheer amount of information United provides through its app. Most recently, United began offering an actual explanation for why your flight is delayed – major kudos, United. The U.S. Department of Transportation requires airlines to issue a full refund on all tickets – including the standard nonrefundable fares – within 24 hours of booking, provided the reservation was made at least a week in advance. 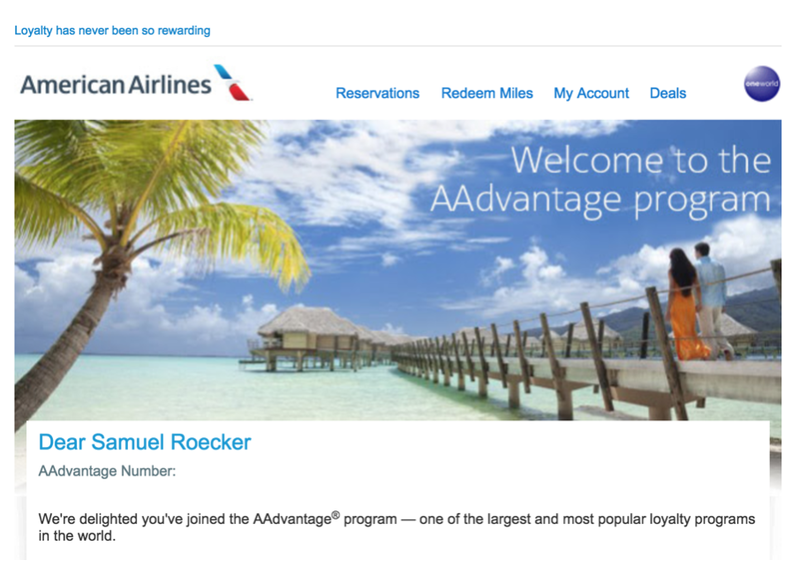 American’s policy is surprisingly generous, allowing you to refund a fare purchased two or more days in advance. I was pleasantly surprised to see a 24-hour “hold for free” option on the payment screen. With the 24-hour refund rule, you could in theory ‘hold’ a fare for 24 hours by canceling, but it’s still nice to offer this benefit if you need time to shop around or confirm other travel arrangements. One small but very noticeable service difference between United and American was the pre-landing mint. While the cheap, plastic-wrapped mints looked rather sad on a large (also plastic) tray, the effort was appreciated, and again, very noticeable after years of flying United. No, it wasn’t anything like the perfectly branded chocolates SWISS offers, but it provides flight attendants with another service interaction and more importantly, an opportunity to thank customers for flying American. That’s a huge win in my book. I’m begrudgingly back to flying United, if for no other reason than my lifelong love affair with MileagePlus. The fare I booked was likely a one-off price fluke since American and United generally have competitive fares ex-Chicago (at least on major routes). I didn’t realize how much I value United’s app and plethora of information until I was without – American needs to step up its digital game. The service and decent food was definitely a nice detour from United’s embarrassing offering on similarly short routes. Nice review and great price!